Let's play! is a new on line class on speed and motivation, starting on Monday, held by my good old friend Polona Bonač. She started agility in one of my classes with her Gordon Setter back in 1998 and is following my methods ever since, have been with me on MANY of my seminars and was the first one to try my RC method and cik&cap (after I trained it with La first). Currently, she is competing with a Malinois, Croatian Sheepdog, Mudi and PRT. 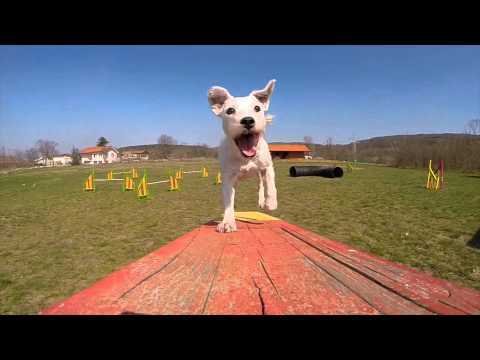 Her class is all about how to find the best way to motivate your dog, how to transfer it to agility field and then to trials and how to make agility just another game. To join the fun, go to her website. Sounds cool :-D! Will be good for Lilo and me or what do you think? Looking forward to lots of fun games! Great! I’m sure it will be lots of fun! It seems that your friend knows very well PRT ! Perhaps a good class to try to solve my trail problems ? Yes, definitely a perfect class for Garlic! I was thinking of maybe doing this class with Lu? I still don’t have one thing that drives her crazy and I really liked some of the things that Polona said on her website about different things… And since we’re about to start competing, it would be good to get a routine and all that, too.. Yes, I think it’s a great class for Lu as well!